Paneer Snack Recipes, Veg Paneer Indian Snack Recipes. 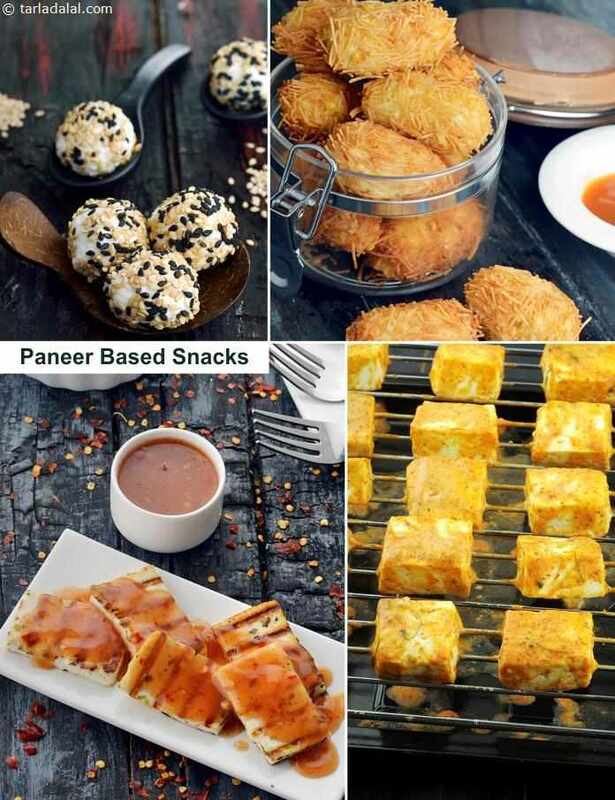 paneer snacks recipe collection. Paneer or cottage cheese is one of the best sources of protein for vegetarians. It has a soft and crumbly texture, also the bland taste makes it a versatile ingredient. From rich subzis to tongue tantalizing starters and delightful sweets, you can use paneer to make a wide range of dishes. A marinade is a seasoned liquid solution which is used to coat food and impart flavor. It is then applied to cubes of vegetables or paneer and marinated for some time. Finally, it is cooked by grilling on a barbecue or putting in skewers and cooking in a tandoor, an oven or simply on a non-stick tava to make tongue-0tickling starters. The Afghani Paneer with a rich marinade of fresh cream, milk and a flavorful powder of melon seeds, cashew nuts and poppy seeds is not only easy to make but also, has melt-in-the-mouth delicate flavors. Hung curd combined with spices and pickle masala and then cooked on a tava to make Paneer Achari Tikka is chatpata and sure to gear up your digestive system! Succulent paneer cubes tossed in an array of Indian spices with a hint of Pavbhaji masala makes Chatakedar Paneer a truly appetizing treat, ideal to serve as a starter. Here is a list of few of my favorite Indo-Chinese paneer starters. The amalgam of different flavors will surely surprise your palette! Deep-frying makes everything tempting and irresistible! A crunchy outer layer and a soft interior, makes deep-fried snacks a delight. The crispy texture can be achieved by coating with crushed vermicelli, papad, bread-crumbs or flour mixture. Paneer can be mixed with an array of ingredients to create a tongue-tingling stuffing/mixture. The Paneer and Apple Grilled Sandwich is one awesome deal that nobody can refuse. You can serve this as a quick snack to your kids. You can make a lusciously creamy mixture of spinach, paneer and cheese to make Palak Paneer Toast. Cut them into thin strips or small triangles and serve them as a party starter. Rolls are the perfect on-the-go meal. A stir fry of paneer and baby corn tossed with oriental ingredients like garlic, ginger, spring onion and soy sauce can be stuffed in chapatis to make wholesome Chilli Paneer and Baby Corn Wrap. Other sumptuous recipes are Aloo and Paneer Roll, Thepla Paneer Wrap or the Tandoori Mushroom and Paneer Open Roll. From all-time favourite starters and snacks like Tandoori Paneer Tikka and Paneer Pakoda to innovative new delights like Paneer Chilli Cigars , you will find a range of attractive paneer-based snack and starter options here. Unfurl the timeless charm of fresh paneer in this section. Enjoy our paneer snack recipes collection below.